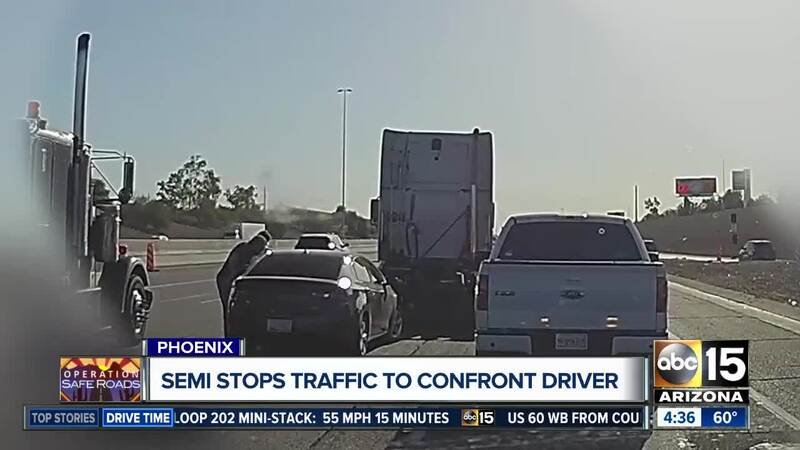 Dash cam footage showed an intense altercation on Interstate 10 in Phoenix after a semi truck driver cut off and confronted another motorist. A bizarre confrontation in the middle of a Valley freeway between a semi truck driver and another motorist was caught on camera, and it forced traffic to stop during rush hour. An anonymous viewer sent ABC15 dash cam video of the moment he came upon the situation. "This was just a normal commute," said the viewer, who did not want to be identified. "It's slow, stop-and-go along the I-10 until we got to 75th Avenue." The man said, what the video does not show, is the Dodge Dart coming into frame. "It comes into the lane on my left, very aggressively," he explained. "But, what happened a second later literally had me saying a couple of expletives." He said the semi slides through multiple lanes of traffic and then cuts in front of the Dodge. That forced all other traffic to have to stop or swerve around. "When I got closer, I realize the driver of the semi has blocked in the Dodge, jumped out of his rig and is now basically in a confrontation with the driver window," the man described. The Arizona Department of Public Safety said they did get a few calls into 911 about this "unknown situation." The video also reveals the trucking company associated with this driver: Turbo Express, Inc., based in Bensenville, Illinois. ABC15 called the company and also sent along the dash cam video for them to see. They declined a phone interview, but instead sent us a statement that said they backed their driver and his decision-making on our Valley freeway. Turbo Express said their truck driver tells them that the person in the Dodge pointed a gun at him. They went on to say, "The incident will be reported to proper authorities." However, ABC15 checked in with DPS multiple times. They have never heard that story from the company or the driver. "The bottom line... whatever happened between the two just a few minutes before, it pales in comparison to what the semi did," the man who captured this video said. "Taking matters into his own hands and endangering the lives of a number of other drivers...That's a 10-ton truck weaving around cars during rush hour." DPS also suggests you do not follow this semi-truck driver's example, per their website . Get out of the way - First and foremost, make every attempt to get out of their way. Put your pride aside - Do not challenge them by speeding up or attempting to hold-your-own in your travel lane. Avoid eye contact - Eye contact can sometimes enrage an aggressive driver. Report serious aggressive driving - You or a passenger may call 9-1-1, but if you are using a cell phone, pull over to a safe location.